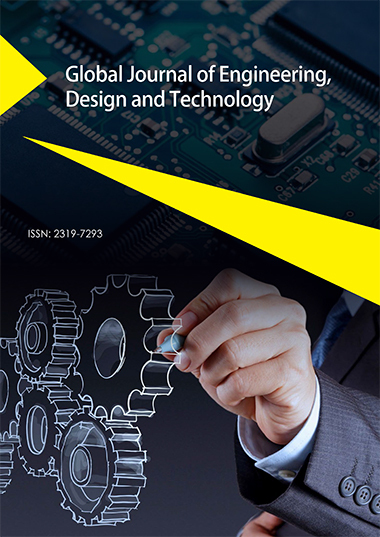 Global Journal of Engineering Design and Technology (GJEDT) is a peer-reviewed International research journal. This online journal offers a platform for scholars, academicians, professionals and students, to contribute the latest research findings in all the major areas within the engineering and technology. The distinguished journal embraces a wide range of topics encompassing broader areas of the field, including Design strategies, Usability and adaptability, Material, component and systems performance, Process control, Sustainability criteria, indicators, measurement and practices, Risk management, Computational Statistics, Computer sciences, Business Ethics, Industrial applications of neural networks, Information and data security, Information indexing and retrieval, Information Management, Information processing, Information systems and applications, Information Technology and their application. The journal encourages original studies as research articles, review articles and case studies from the aforementioned subject categories. The journal offers a platform for the academia to elevate their image as internationally acclaimed scholars with its presence online across the continents of the globe. Researchers can also ripe the benefit of enriching their study by submitting manuscripts to the editorial board that comprises of scholars with proven abilities and established research track record. All the articles submitted for publication are subjected to rigorous single blinded peer review to ensure quality before it gets published. Authors’ scholarly work undergoes critical scrutiny by experts in the same subject to check for scientific validity, relevance and accuracy. Manuscripts will be published upon getting the final approval from the editorial board members. The journal supports open access publishing model to maximize the reach and visibility of the published research. Authors can track the article status from the Editorial Manager System of the journal which allows authors to submit article, track status and respond to reviewers’ comments and revision requests. This multipurpose tool allows editors and reviewers to get access to the manuscript for review and to communicate with author.